Arbour is probably best known as the coach that created a dynasty out of the New York Islanders in the 1980s, or the second winningist coach of all time. Arbour is beloved by Blues fans as well, as he was one of the first to wear the Bluenote. He was hired as coach of the Blues halfway through his last season, and was let go due to lack of playoff success. Needless to say, Arbour is one of many who has been let go or traded by the team only to win a Stanley Cup elsewhere. “Al’s a good sergeant, but he’s no general” may be the most Blues assessment of a member of the franchise on record. 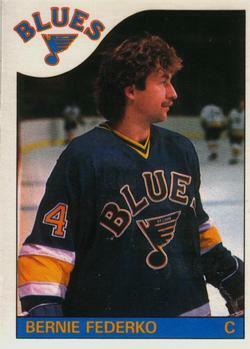 Hall of Famer Bernie Federko (I believe that may be his full legal name now) played for 13 seasons with the Blues and one final season with that team everyone plays for before they retire. The franchise leader in games played did the Blues a parting solid, by being part of the trade that helped bring Adam Oates to St. Louis. Bernie holds the team records for assists (721), points (1073) and most confusing things said during a home broadcast (pick a date). Curtis Joseph was supposed to be the Goalie of The Future, before being claimed by both the annual Blues Goaltending Pile-On conducted by their fans and Mike Keenan. "I couldn't imagine anyone treating other human beings that way," Joseph once said in regard to the treatment by his coach. "I had had it. I even cleared his (Keenan's) desk one day when our conversation got a little heated. The trade to Edmonton (for Shayne Corson and Marty Reasoner on 28 July, 1995) was the best thing that ever happened to me. I couldn't take it anymore." Dan Kelly was the radio and later television play-by-play announcer for the St. Louis Blues. 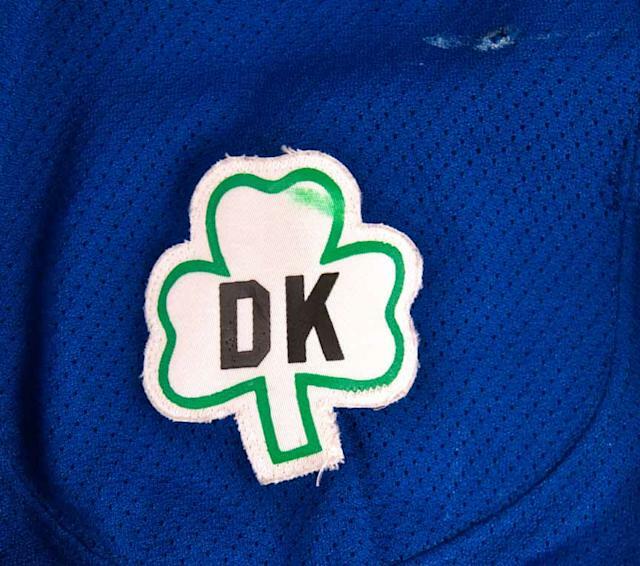 He passed away in 1989 due to lung cancer, and a banner with a shamrock was raised to the Kiel Center rafters. The players also wore it as a patch for that season. His son, John, is the current play-by-play analyst for FoxSports Midwest’s Blues broadcasts. 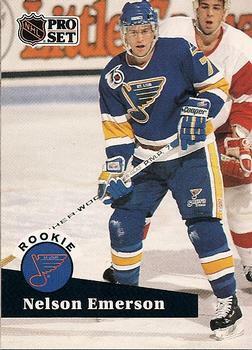 Emerson was drafted 44th overall in the 1985 entry draft. In three seasons with the Blues he potted 45 goals and added 87 assists before heading to the Winnipeg Jets. He also was, inexplicably, one of the most sought-after rookie cards around when I was a kid. I wound up with the Pro Set one. Paul Cavallini lost the tip of his finger while blocking a Doug Wilson shot in 1990. He’s now a stockbroker in St. Louis. 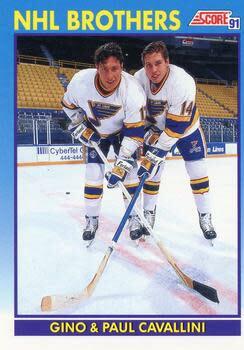 His brother Gino suited up for 454 games for the Blues. They are still favorites on The Hill, St. Louis’ Italian neighborhood, where one goes for bocce ball and to carbo-load at Rigazzi’s before a home game. Who could forget those thrilling 18 regular season games and 13 playoff games where Wayne Gretzky skated with the C on his chest for St. Louis? Probably everyone, unless you’re Steve Yzerman. Gretzky wanted to retire a Blue, but couldn’t deal with Mike Keenan anymore. Instead, Gretzky skated his last season with the New York Rangers before retiring. He still pops up at Blues games now and then. Brett Hull is the reason that St. Louis is cranking out young and talented players, he’s the reason that so many people in my generation love the Blues, and he’s the reason that so many hate Mike Keenan. Every bit of that is deserved. Sid Salomon III losing Scotty Bowman and Al Arbour. Ralston Purina handing the team over to the NHL. Bill Laurie’s fire sale that sent Chris Pronger to Edmonton. Firing Joel Quenneville. Made-up shutouts and a hoped for Stanley Cup parade down “Market Avenue” by Dave Checketts. The Blues aren’t cursed, they just have had a string of questionable ownership groups. Thankfully, that string’s broken. The Blues color announcer is Darren Pang. You may have noticed that he has a catchphrase. For some reason, it has been set it to music. Sure, Brendan Shanahan for Chris Pronger worked out well for the Blues, but you have the deplorable low-balling of Brett Hull during contract discussions a season after Keenan stripped the captaincy from him in favor of Shayne Corson, and you have the loss of Gretzky, who wanted to retire as a Blue. You have battles of will, you have Keenan coaching far under expectations after his 1994 Cup win with the Rangers. All of this was nicely summarized on Brett Hull’s Hall of Fame night by one intrepid fan, who shouted “I HATE MIKE KEENAN” during a quiet moment. Hull and Keenan might’ve cleared the air, but Blues fans may never not despise Iron Mike. 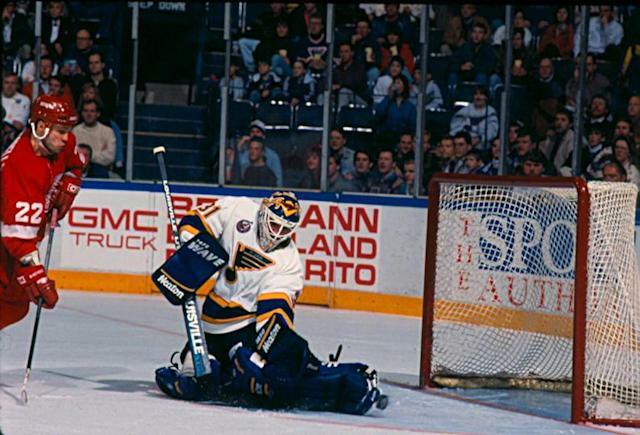 Blues fans were chanting goalie names that sounded like boos before it was cool. Liut, a Blues draftee, amassed 65 wins his first two seasons; he would’ve won the Hart Trophy in 1981 if it weren’t for Wayne Gretzky. He had to settle for the Lester B. Pearson Trophy instead. Unfortunately, after his stellar first two years, Liut never cracked .500, and was traded to the Hartford Whalers. He currently is making his way in the world as an agent for Octagon, representing Vladimir Tarasenko among others. May 12, 1986 may be one of the most Blues-like moments in history. Hope soon to be followed by defeat is a theme with this franchise, and this may be the ultimate example of that. Down 5-2 with 12 minutes to go in game six of the Western Conference Finals, the Blues erased the deficit in 12 minutes with goals from Brian Sutter and Greg Paslawski, who also scored the third goal in tremendous fashion to send the game to overtime. Doug Wickenheiser potted the overtime game winner. The Blues lost game seven in Calgary, 2-1. They wouldn’t return to the Western Conference Finals until 2001. The Blues, who were in danger of being moved to Saskatoon thanks to Ralston Purina no longer wanting to own a hockey team. There were lawsuits and countersuits between the group out of Saskatoon, Purina, and the NHL. The uncertainty led to the Blues not having a representative at the 1983 draft. No representative, no draft picks. It’s the only time in NHL history that a team did not participate in the draft. Bob, Billy, and Barclay taught the Flyers how to be Bullies. On January 6th, 1972, a Flyers fan decided to dump a beer onto Blues coach Al Arbour. The team took exception to that. Led by Bob Plager and Phil Roberto, a gaggle of Blues players (including Barclay) went into the stands to find the offending fan. If this sounds familiar to anyone who isn’t a Blues fan, pop in a copy of Slap Shot for a refresher. This melee, along with the Plager Brothers reputation, served as the inspiration for the Hanson Bros. Much like some of the Chiefs wound up having to be bailed out later that night, so did some of the Blues. Oh, look, another coach fired by the Blues who went on to have great Stanley Cup success. Joel Quenneville’s record after six full seasons and portions of two others was 307–191–77–18. He also helped guide the Blues to a President’s Trophy and the Western Conference Finals, so sure, obviously it made perfect sense to let the guy go. The Blues acquired Red with Barclay Plager from the Rangers in 1967. Later that season he scored a double hat trick against the Flyers. Traded in 1970 to the Detroit Red Wings in exchange for Gary Unger. The Wings traded Berenson back to the Blues after four years, and Berenson retired with the team that helped solidify his star status. 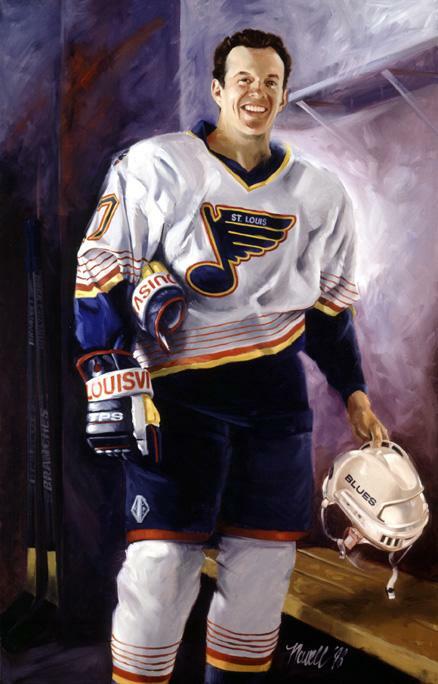 Yes, Brendan Shanahan came to St. Louis thanks to the deal that sent Stevens to the New Jersey Devils (the first of two controversial deals involving Shanny for the Blues), but the deal cost the Blues’ multiple draft picks. First they sent five picks to the Capitals for Stevens. Then GM Ron Caron signed Shanny to an offer sheet, and as compensation the judge gave the Devils Stevens, who promptly requested a meeting with his attorney while he refused to report to Devils training camp. Was this the NHL getting back at the Blues for the deal that got Stevens to begin with? The world may never know, but the Blues offer sheeted Stevens in 1999.This offer sheet cost the team another five first round draft picks. In the 1999-2000 season, Turek was lights out, posting a 1.95 GAA and a .912 save percentage while accumulating a 42-15-9 record. He then lost four games in the playoffs with a .275 GAA and a .882 SV%. Basically, typical Blues playoff goaltending. Unger played 917 games in a row between 1968 and 1979. Nine of those seasons were with the St. Louis Blues, before Unger left to join the Atlanta Flames. He, along with Keith Tkachuk, Joe Mullen, and Berenson, all have their number 7 honored by the Blues. If every letter in this post could’ve been given to one player, I would have gladly written an entire article featuring Yladimir Yeresenko, Hladimir Heresenko, and Zladimir Zeresenko. He’s the first superstar for the Blues since Brett Hull, and his recent contract is proof that he’s the cornerstone of the team for the foreseeable future. Only the 6th American to score 1000 points, Keith Tkachuk spent 2001-2007 with the Blues before being traded to the Atlanta Thrashers for Glen Metropolit and a slew of draft picks. After the Thrashers’ one failed playoff run ended, Tkachuk returned to the Blues and finished his career there in 2010. His retirement may have been hastened by injuries sustained after scoring a goal against the Chicago Blackhawks with his face. Watch the players on the bench. Barret Jackman, recently signed by the Nashville Predators after being told the Blues were going in a younger direction for defense, is second all-time in franchise games played. Bobby Plager gave him special dispensation to wear his number 5; Bobby was on to something – Jackman won the Calder trophy in 1999, beating out Rick Nash and Henrik Zetterberg. Never forget. This one came down between Yake and Yan Stastny, and Terry got more votes on Twitter. Congrats, Terry! Yake spent two and a half seasons with the Blues, posting not bad numbers, before being traded to the Washington Capitals and then fading into AHL/European obscurity. Yake, like many former Blues, has made his home in St. Louis, where he sells meat. Meet the author: Laura’s been a fan of the St. Louis Blues since childhood, which makes for about 25 years of futility for her. She hopes that a Stanley Cup win isn’t 25 years away, but still has a wheelchair and an escape plan to get her mother out of the nursing home to see the parade. Follow her on Twitter @hildymac, or visit St. Louis Game Time, which she is the managing editor of.